Listen - - you can almost hear the bugling elk in the crisp mountain air! Carved in knotty pine with a custom elk antler door handle. 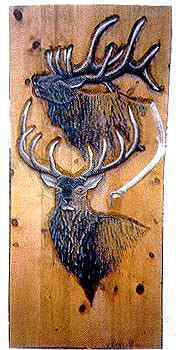 Notice the pleasing contour of the handle and how it compliments the elk's antler in the carving.